We’ll see how long my boycott actually lasts…until next month’s mouth watering cover photo perhaps? We all have our obsessions (right???). I say, if it’s [mostly] positive, and it gives you ideas and actions to talk and plan and dream about, instead of resorting to gossip or negativity, then dive on in to whatever your jam may be. Food, fashion, coffee, knitting, bicycles, cross fit, painting, whatever. Don’t be afraid of where it may take you. You may just find yourself an expert on the subject. Personally, I can be a little too quick to judge, or get jealous of, someone else’s pursuits, but what fun is it if we’re all doing our thing in a vacuum, without community to learn from or to spark even better ideas? No, I didn’t get some negative blog comment which is fueling this post. It’s just a reminder, partially to myself, that I keep on posting week after week because I really do love exploring food, and specifically the logistics of using food to maximize our health and happiness every day, on schedule, for breakfast, lunch, and dinner. Not always an easy feat. If you have more pressing priorities or different passions than reading my foodie ramblings, then take the recipes that work for you and run with them! I’ll do the research (and testing and photography), you do the cooking. And please let me know how I can help with specific resources and recipes. I welcome the challenge, especially if it would make your life easier and better in the food department. I have to say, cooking through these gratins has lightened my meal planning load just a bit. 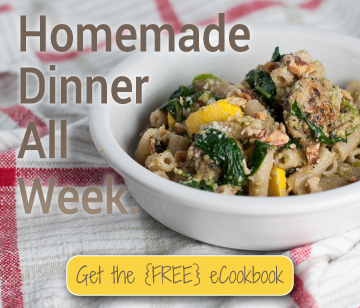 I know that one night of every week, all I have to do is make the next one in the cookbook. I’ve banned the camera until the gratin is golden and bubbling and ready to serve, so it’s just me, my knife, and some wine decompressing in the kitchen for a couple hours. Best of all, it removes one decision I have to make every week. As I discussed last week, gratins, aside from being perfect cozy winter cuisine, tend to freeze well, working for households of any size. But what about all that leftover milk and bread from the recipe? If, like me, these are products you rarely use in your other cooking, I have a solution for you that doesn’t involve forcing yourself to eat gluten and drink cow’s milk just because it’s there and it’s about to go bad. Answer: the freezer. Bread and milk freeze easily in any form. I froze the remaining half loaf from last week’s bread topping and thawed it for this recipe. I cut off the crusts, food processed it, reserved the fresh bread crumbs I needed, then popped the remaining crumbs into the freezer for a future third use. Five dollar loaf of decent quality bread divided by three uses. You do the math. Call me an easy sell, but The China Study has me convinced that my existence at age 29 is nothing short of a miracle, given the volume of cow’s milk I’ve consumed in my lifetime. Whether or not it’s ignorant, I haven’t switched over to nut or plant milks 100%, but when I cook with cow’s milk, I go for high quality, local, organic stuff. Instead of scrapping a cup or two of it once I’ve cooked the gratin and maybe used a little in my coffee, I fill paper Dixie cups with a half cup each, freeze them, peel away the paper, and put the half cup “cubes” into a freezer bag. Thaw in the refrigerator 24 hours ahead of time for the next use for best (and least separated) results. A little work for reduced waste and spending. This cauliflower, smoked cheddar, and caraway gratin was unanimously voted a household favorite out of the three gratins I’ve made so far. It was the first “traditional” gratin, with a rich, creamy bechamel sauce and plenty of cheese. Honestly, it acts more like mac and cheese made with cauliflower, instead of noodles. 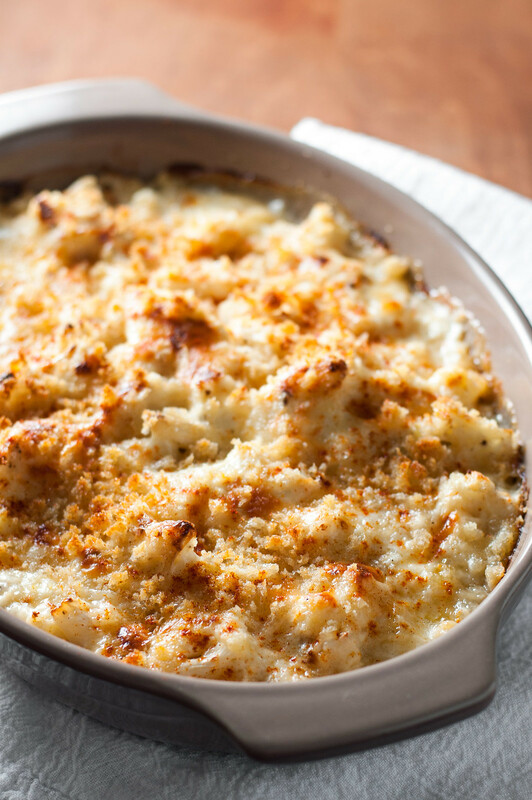 Or does mac and cheese act like a gratin of noodles, instead of vegetables? Which came first? I might actually vote the gratin on that one. Regardless, to make it a meatless meal, serve with a small baked sweet potato for everyone (I topped mine with vegan buttery spread and sharp aged provolone), and some kind of green veggie. On a cold night, I opted for a third warm dish, sauteing leftover roasted golden beats with some onion and the beet greens I had saved and cleaned. A perfect, satisfying, and mostly seasonal meal. 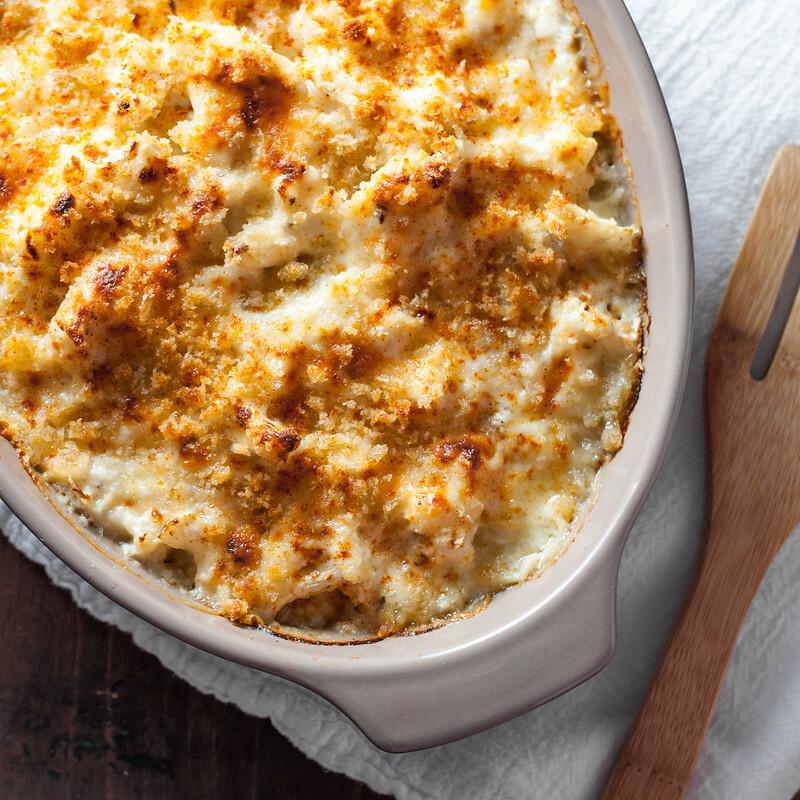 While the original recipe in The New Vegetarian Cooking for Everyone declares this an old-fashioned treatment of cauliflower, I say there's nothing more timeless and homey than surrounding roasted veggies with classic bechamel and deep, smoky cheddar cheese. Preheat oven to 425 degrees (F). Grease an 8 by 10 inch rectangular dish (at least 1½" depth; or oval gratin dish about 8½" across at the shortest width) with 1 teaspoon butter. 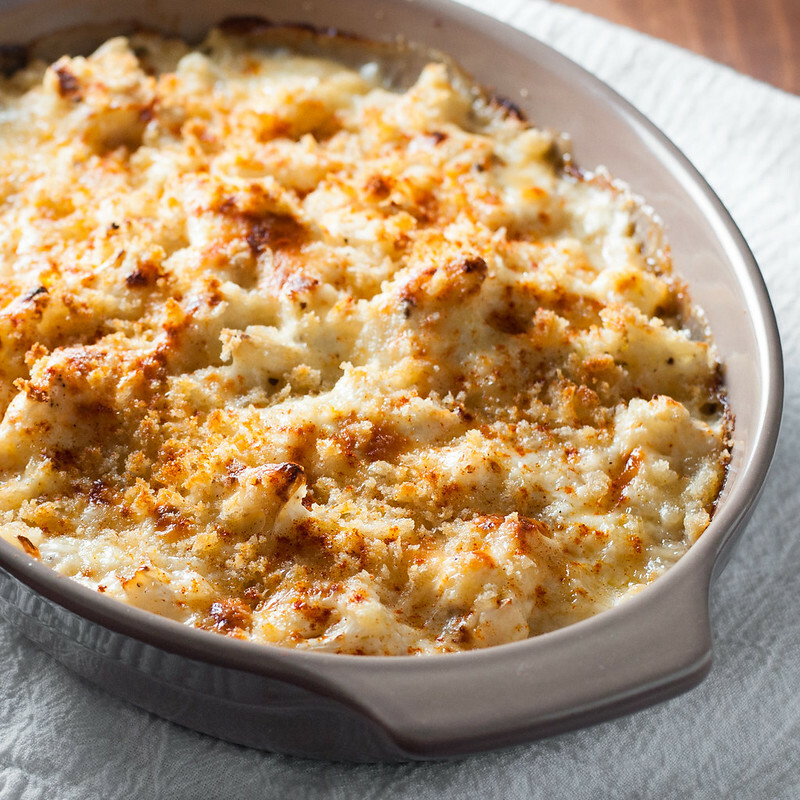 Toss cauliflower pieces with oil, ½ teaspoon salt, and ¼ teaspoon pepper on a rimmed baking sheet. Roast about 8 minutes in lower third of oven, until just beginning to brown. Reduce oven to 375. Press firmly on an even layer of caraway seeds with a rolling pin, pan, or heavy baking dish to crush them (they'll stay intact but become fragrant and release flavor later). Heat the crushed seeds, milk, onion, and bay leaf in a small saucepan over medium high. When just boiling, turn off heat and allow to steep. Melt 2 tablespoons butter in a medium saucepan over medium heat. Add flour and stir constantly for 2 to 3 minutes, to cook the raw taste out of the flour. Slowly pour in warm milk mixture, including additions, while whisking, to combine. Increase heat slightly to bring to a simmer, while whisking or stirring with a wooden spoon. Maintain a gentle simmer and stir constantly until thickened, 6 to 7 minutes. Season white sauce with ¾ teaspoon salt and ¼ teaspoon pepper, or to taste. Melt last tablespoon butter in the microwave (about 45 seconds, 50% power) and stir into bread crumbs to coat. To assemble, spread cauliflower evenly in prepared baking dish. Cover with half the grated cheddar, then pour white sauce evenly over the top, removing the bay leaf. Sprinkle with remaining cheese, then top with the buttered bread crumbs. Baked assembled gratin at 375 (F) for 30 minutes, until top begins to brown. If not golden after 30 minutes, heat about 8 inches from the broiler for a few minutes, or until desired shade is reached. Cool for a few minutes, then dust with paprika, if using. Scoop onto plates to serve, trying to keep the bread crumb topping face up. To make fresh bread crumbs, remove crusts from sturdy fresh bread. Cut into large chunks and pulse in the food processor until desired crumb size and uniformity is reached, a minute or two. Note: this page contains affiliate links. It does NOT contain sponsored content. Affiliate links (to products I use, on Amazon) offset my food and website maintenance costs, so I can keep bringing you cozy recipes like this one. Thanks! This gratin looks fabulous. I love coming in from the cold to a hot dish dinner! I’ve used cauliflower before in a 50/50 ratio for a cheddar & beer baked macaroni before, and now much prefer it to just straight up noodles. Cauliflower makes such a great platform for rich sauces. Can’t wait to try this recipe! Oh, I love the 50/50 idea when some real carbs are called for! 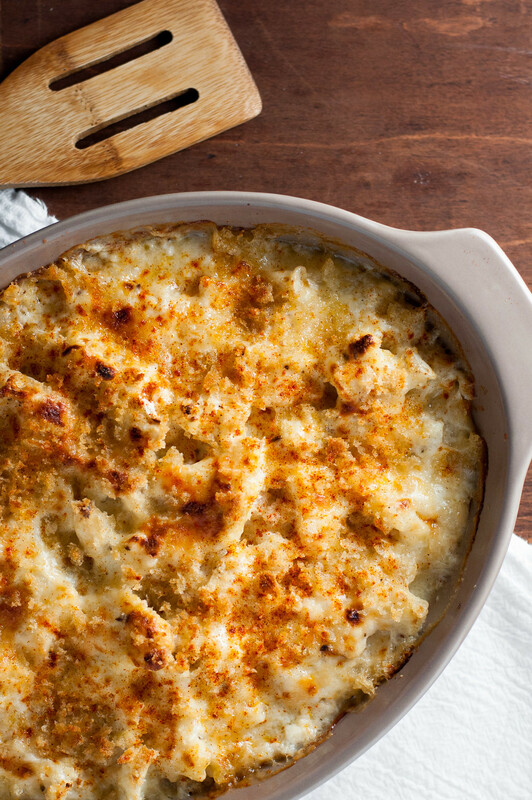 Love a classic gratin! This just looks SO comforting, chees-y and delicious. The perfect meal to end a long day in my eyes! Anonymous:The $64 billion is NOT the total compensation paid to physicians, it is the EXCESS COMPENSATION due to the excessively high salaries here compared to Europe/OECD, etc.Or, if U.S. physicians were compensated similar to other advanced countries, we would SAVE $64 billion.